March 1960 cover. 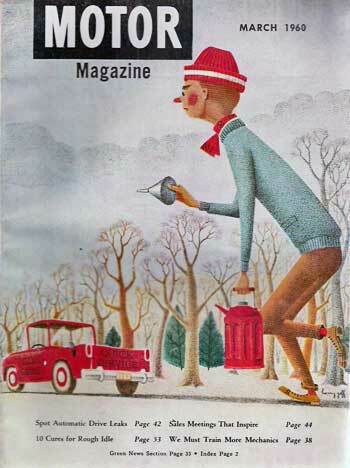 On a cloudy early winter's day, the elongated, cartoonish figure of a man dressed in an aquamarine sweater, tan pants, and a red knit cap, holds a funnel in his right hand and carries a red gas tank in his left as he heads to his waiting red service truck. Harry Sharp Goff, Jr., (1905 — 1993) was born in Haddon Heights, New Jersey. Once he completed high school, he went to work as an artist for a paper manufacturer. He was a cartoonist and illustrator whose work appeared in such publications as True, Sports Afield, Mechanix Illustrated, U.S. Camera, Fauna, Esso, Farm Journal, and Jack and Jill. His work graced the book cover of 1948's You and the Law. In 1959, he did book cover art for The ABC Teacher's Guide: American Adventures and Bertie Comes Through. In 1981, he illustrated another book, Inventions Wanted. His distinctive, cartoonish MoToR work for covers and interior illustrations lasted from 1956 to 1963.